Step away folks, nothing to see here. I'm back in town for a whole week! Yes, a whole goll darn week. Can you believe it?! I can't but I promise the Bread Baking Babes I'm going to put it to good use because this month's bread, to paraphrase a line from one of my favorite chick flicks "Pretty Woman", has potential. If you know that movie then you know which scene I'm talking about and when you see the incredibly...um...firm and well shaped Brioche Mousseline our host kitchen, Monique of Living on Bread and Water and the other Babes listed over there on the sidebar created, you will understand exactly why I picked that scene. Anyways, today is posting day and because of my travel schedule I haven't had a chance to bake the bread. So, I'm going to be a Buddy this month and do my level headed best to bake it this week. 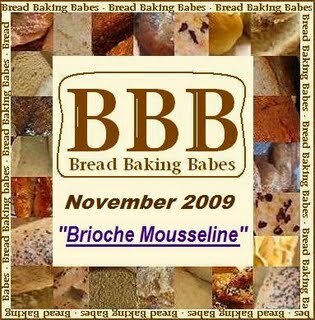 If you want to join me as a Buddy this go around, all you have to do is bake the Brioche Mousseline, post about it on your blog, and email Monique with a picture and/or a link to your post by November 23rd. Bet this bread would make fantastic rolls for Thanksgiving or even Christmas, because Monique says it freezes beautifully. from Bernard Clayton Jr's "The Breads of France"
Dress up the cans by encircling the cans with paper(buttered if needed )as a collar. Butter the inside of the can or , better , line in with paper. Dissolve yeast in water and set aside for a few minutes until creamy.Stir in flour and knead for about 3 minutes until shaggy loaf of dough. Cover with plastic and let rest for 2 hours. In mean time prepare rest of dough :Start with 2 cups of flour , 4 eggs (stir in one at the time), 2 table sp. water ,sugar , salt and blend it all. Knead butter (on a lenght of wax paper) soft and pliable with a doughscraper or spatula.Blend in batter.Than add remaining 2 eggs and spoons of water.Stir in rest of flour , 1/2 cup at the time until the dough is a soft ball.Press into oval on your flowered work surface , place starter in the center and fold over the edges and knead to incorporate the withe starter dough with the yellow egg and butter dough. Knead for about 8 minutes. The dough stays a little sticky but will become firm after cooling in the fridge if that will help you kneading. At room temp. covered wth plastic wrap, until more thsn double.It becomes light and puffy. For at lest 2 hours in the fridge. Overnight is also possible but it will need a longer rise in the mold later on. Fill the coffecan for 2/3 and allow to rise. How high the rising will be depends on the strength of flour thats been used. There will be a difference between different flours from different places in the world. The Brioche is done when the crust is deep brown. Or use a cake testing pin, that has to come out clean .